TerryChristianson Iamnevertoobusyforyourreferrals…ifyouhaveany Iamnevertoobusyforyourreferrals…ifyouhaveany friends, relatives or colleagues interested in purchasing friends, relatives or colleagues interested in purchasing orsellingrealestate,pleasecontactme. orsellingrealestate,pleasecontactme. 1601BuﬀaloPlace• 1601BuﬀaloPlace• CELL204 226-7190 • 204 226-7190 • FAX204 452-4359 EMAILterryc@mymts.net • terryc@mymts.net • WEBSITEwww.southwinnipeg.com www.southwinnipeg.com REALTOR® ProudTorchAwardFinalistforthesecondyearinarow! ProudTorchAwardFinalistforthesecondyearinarow! 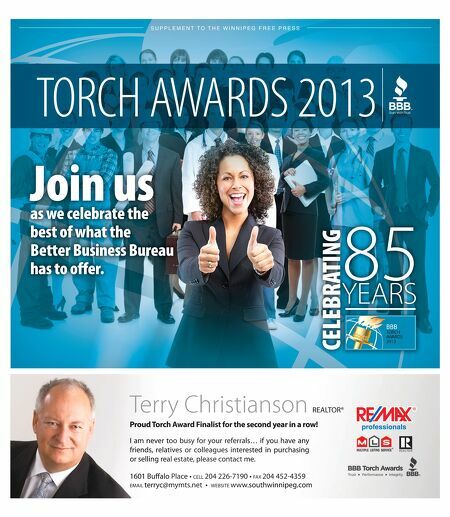 professionals S U P P L E M E N T TO T H E W I N N I P E G F R E E P R E S S TORCHAWARDS2013 85 YEARS CELEBRATING Joinus aswecelebratethe bestofwhatthe BetterBusinessBureau hastooffer.